Information regarding the Obj 261-2 and 261-3 is actually rather hard to find, there’s an image of a mock-up which some sorces claim as the Obj 262 with its 152mm, others the Obj 261-3 with it’s 180mm. The Obj 261-1 actually has a fair amount of information but no actual designs (that are readily available on the internet anyway). So while I might not be able to provide a full comprehensive development history of all the tanks I will be able to provide details regarding the development history of the armaments. The Obj 263 has a good amount of info regarding it as well as a photo of the mock-up built for it. 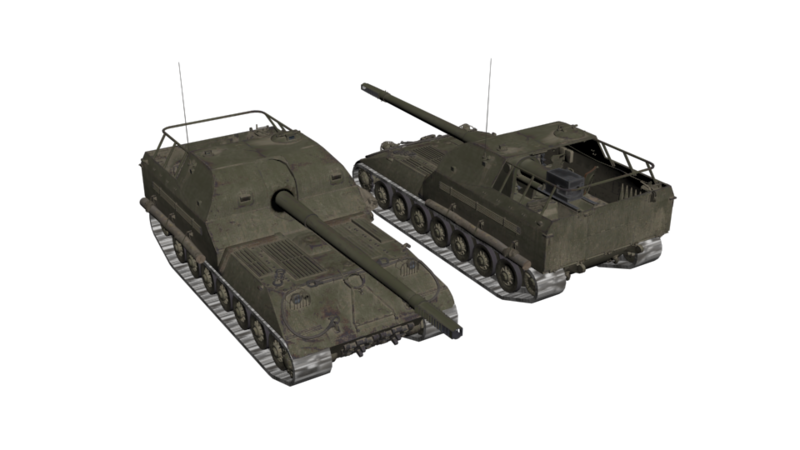 The Object 261 was developed around 1947 in the Kirov Plant (Factory No. 100) who were the most experienced with the Obj 260. This was because, along with the chassis, the M-50T engine as well as transmission would remain the same throughout the development. The engine, as already stated, was to remain the M-50T which was designed for torpedo boats and originally derived from the ACh-30 aircraft engine and produced 1,050hp which had already been fitted into the IS-7. No official designs are readily available on the internet depicting the Obj 261-1, however there is text referring to the Obj 261 as being as an enclosed, forward fighting compartment. It’s unknown how it could have looked, but it’s safe to assume the casement would visually be similar to that of the Obj 261-3 or the Obj 263. The more likely design would have been the former as development notes state that the casement of the Obj 263 was redesigned. Text tells that the role in hostile engagements was not planned during it’s design. Due to this the fighting compartment was lightly armored with no value given, however the hull retained a considerable amount noted at 150 to 215mm on the hull front. The estimated weight was to be about 68 ton, the same weight as the IS-7 itself. This gave it a respectable power to weight of 15.44hp/t. The designers calculated that with the M-50T engine and the subsequent power to weight, a top speed of 55km/h would have been achievable. For a heavy SPG it would have been well armored and quite mobile, the gun allowing it engage targets both directly and in-directly. The original armament for use was to be a heavily modernized 152mm Br-2. The gun was developed by Factory #172 and designated as the 152mm M-31. It was to have identical ballistics to the Br-9 giving it a muzzle velocity of 880m/s. The modernization was so extensive that there wasn’t actually much left of the original armament. Development of the 152mm M-31 continued at Factory #172 where an even more powerful 152mm gun was developed, designated 152mm M48. It featured a powerful slotted muzzle break capable of absorbing 70% of the armaments recoil while also firing a round with a muzzle velocity of 1,000m/s. This 152mm M48 would be the weapon chosen for the design of the Obj 261-2, later designated as the Obj 262. 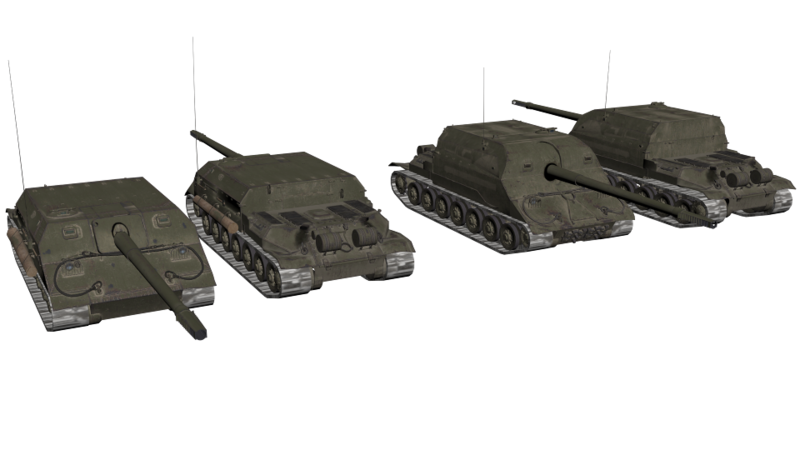 After the cancellation of the Obj 260 based heavy SPGs development of the 152mm continued at Factory #172 where they would later produce the 152mm M53 which was used on the SU-152P and early versions Obj 268 before finally ending with the 152mm M64 just before the Obj 268 was cancelled. Unlike the Obj 261, the 262 was to have the fighting compartment over the rear of the tank resulting in the engine and transmission to now be located at the front. The now front of the tank was redesigned to be better protected providing while providing the same 150 to 215mm of armor. 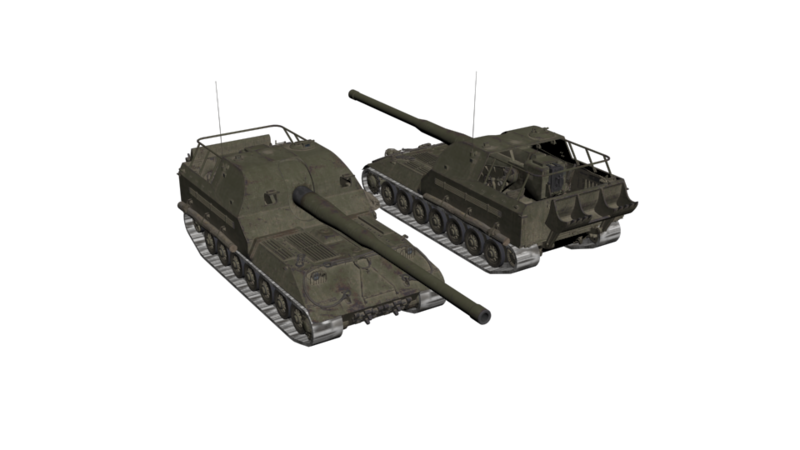 The third design, Obj 261-3, was to be the same as the Obj 262 in every way except for the armament, it was planned to use the 180mm MU-1. In 1939, the technical requirements were given for it to have the same ballistic properties as the B-1-P. In the same year, Factory #172 designed the MU-1. One year later, work on the gun stopped due to the MU-2 project but was then restarted in 1943. In 1945, a GKO (Government Short-term Commitment) decree has a batch of MU-1 guns produced without testing a prototype. The Barrikada factory in Leningrad produced 12 ocillating elements for the guns in 1947 while Leningradsky Metallichesky Zavod, or LMZ, produced 12 mounts. By 1948, twelve 180mm MU-1 guns had been assembled. This puts them readily available to be mounted on the heavy SPG Obj 261-3. But with the cancellation of the development it was never meant to be and all the guns were used either as coastal batteries or on naval ships. Had development continued the Obj 261-3 would most likely have been re-designated as the Obj 264 due to the Obj 263 designation already in use by another heavy SPG, also designed by the Kirov Plant. The gun was based off the 130mm B-7 naval gun where it had received substantial modernization to the point that so little was in common with the original except for the caliber. The improved gun, S-70A, was a large size with a barrel length of 57.2 calibers, or 10.29m. The size of the gun breech was also increased as well as the recoil device. The increased breech size cause an issue in that firing the gun would cause the recoil to hit the back wall of the fighting compartment. This was an issue they had encountered when designing the Obj 262 and 261-3. The solution was the same. The back was hinged at the bottom and would open downward when in position, the dosser blade would then dig into the ground and reduce the rocking of the tank when firing allowing the gunner to re-align the gun faster. There was a more severe downside to this though, because of the increased breach size, the assisted loading mechanism from the IS-7 could not be used, this caused the estimated rate of fire per minute to only be calculated at 1.5 shots per minute as opposed to the IS-7’s six shots per minute. To compensate for this, it was the view of the military and developers that it would be used to utilize the features of the long-barrel. From a distance of 2,000m using the AP round BR-482, the S-70A was capable of penetrating 170mm of homogeneous armor at a flat meeting angle of 90 degrees. The development of the SPG’s were held off due to delays with production of the IS-7 and also problems with mass production of the IS-4. While no official reason for the discontinuation of the project was given, one source claims it toe be due to the emergence of new armor-piercing ammunition and features of the road network in the country. This seems to hold true as another source stats the cancellation being because the railway platforms and highway bridges couldn’t withstand the weight of the heavy tanks over 50 ton. As such, in 1949, the Council of Ministers of the USSR issued decree #701-270ss which canceled development and production of all heavy tanks that weighed more then 50 tons. As such the IS-7 development was cancelled, shortly followed by the Obj 261 series. In 1951, the last conceptual design for the SPG was ready and was presented to the commission of the Ministry of Defense. Weeks later the order to end the project came. A powerful 130mm gun was a good argument but the calculated weight of the Object 263 was 60 ton. 8 ton lighter then the IS-7, but 10 tons too heavy under the new decree. With that, the last of the heavy SPG’s based on the Obj 260 came to an end. 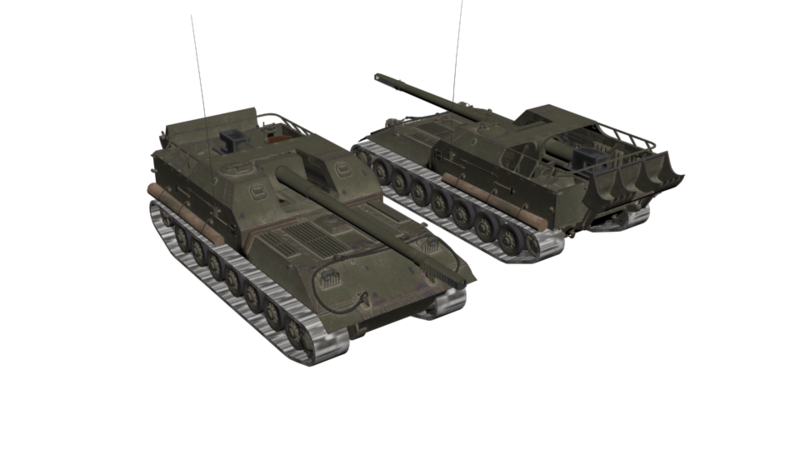 The mock-ups built for the Obj 261-3 and 263 were dismantled and focus turned to the lighter Obj 730 and the Obj 268 based on its chassis. DA Gaming Create a free website or blog at WordPress.com.